The unemployment rate for 15– 64-year-olds was 3.8% in February, a 0.6ppt drop on a yearly basis. The number of unemployed increased to 177.7k, mainly due to seasonal factors. The Hungarian Statistical Office (HCSO) registered nearly 4.388 million employed people in Hungary, showing a slight increase compared to January. Employment rose by 1.4% YoY among 15– 64-year-olds in February, so the need for labour doesn't seem to be easing. The picture is even rosier, if we consider the number of employed in the primary labour market increased by 129.4k YoY, while the number of fostered workers and those working abroad still continues its decline (-59.9k YoY). 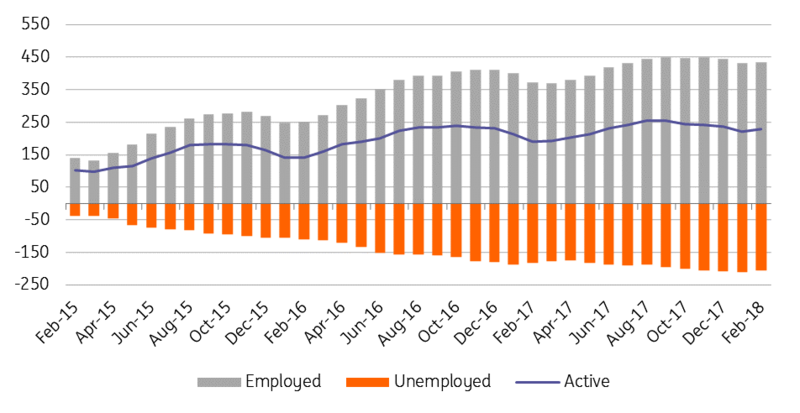 The Hungarian labour market is improving steadily but things are slowing down as we reach close to full employment. The glaring shortage of labour will pull back the pace of labour recruitment and also drive up wages. We expect unemployment rate to reach 3.7% by the of the year, combined with average wage growth of 10% YoY.